WASHINGTON (Feb. 06, 2008) -- The Army and the University of Kansas struck up a partnership that will allow wounded Soldiers to earn a master's degree at the school and to apply what they have learned inside the Army's own academic community. 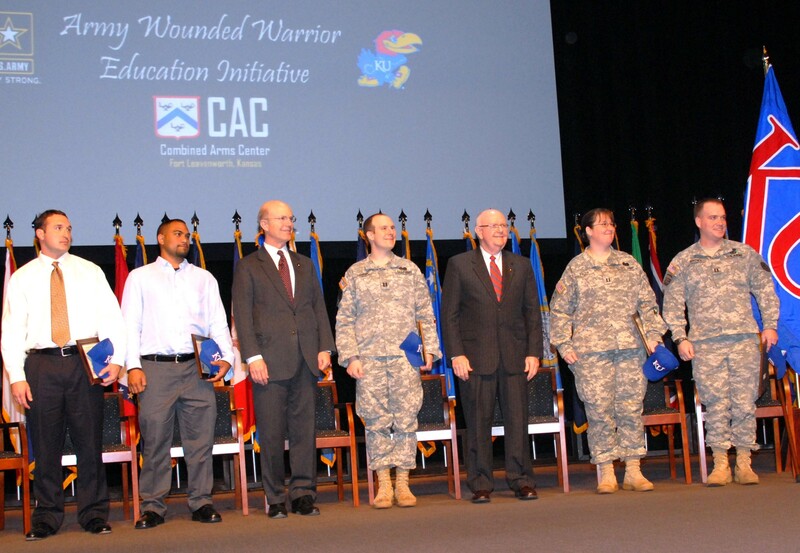 Secretary of the Army Pete Geren and Chancellor Robert Hemenway of the University of Kansas announced the "Wounded Warrior Education Initiative" today on the campus of the Command and General Staff College at Fort Leavenworth. 1st Lt. (Ret) Jason Gladney, Capt. (Ret) Wesley E. Fine, Secretary of the Army Pete Geren, Capt. Tim Hornick, Channcelor Robert Hemenway of the University of Kansas, Capt. Kristin Facer, and Capt. Gates Brown attended a ceremony Feb. 6 on the campus of the Command and General Staff College at Fort Leavenworth to announce the start of the Wounded Warrior Education Initiative. "There's so much pent-up generosity out there in the American public," Secretary Geren said. "Americans want to step up and do something for our Soldiers. "And Chancellor Robert Hemenway had a good idea - let's develop this partnership, to help Soldiers that want to continue their education. Let's figure out a way to make this work to help these Soldiers continue professionally, to pursue their professional and educational dreams." Soldiers and those medically retired who are part of the Wounded Warrior Program are eligible to participate in the new education initiative. They must already have a baccalaureate degree and must also be physically and mentally prepared to attend school. Under the pilot program, participants will complete their master's degree at the University of Kansas, while the Army picks up the tab for that education. "The welcome mat is out at KU," Chancellor Hemenway said. "I look forward to having a great group of Soldiers among us and we will do everything in our power to help them succeed. This is an exceptional program; it is good for the Army because the Army will retain talent and the spirit of courage. It is good for KU, (because) we are determined to do what we can as a public university, known for supporting Soldiers, to contribute to the larger purposes to which the Army and these men and women have given so much." At the completion of their degree program, graduates would take jobs as faculty or staff at the Army's Command and General Staff College or Combined Arms Center here. Those Soldiers who are still on active duty would remain on active duty, while those retired due to injury would serve as civilian instructors. The program is one way the Army can stem the loss of military knowledge, education and experience that comes when wounded Soldiers leave the service, officials said. By helping wounded Soldiers complete their master's degree, the Army can keep some of that corporate knowledge in house. Participation in the pilot program now has been offered to eight initial candidates: retired Spc. Michael Hogg; Capt. Tim Hornik; Capt. Kristin Facer; Capt. Gates Brown; retired Capt. Michael Reynolds; retired Capt. Wesley E. Fine; Staff Sgt. Thomas Davis and retired 1st Lt. Jason Gladney. All eight Soldiers were injured in combat while serving in Iraq and all received Purple Hearts. If these wounded warriors choose to complete their education at the University of Kansas, they will take jobs at CGCS, filling positions already identified by the school and applying their own education and personal experience to benefit students enrolled there. Those wishing to participate in the Wounded Warrior Education Initiative must have been wounded in the war on terror and have a campaign medal. They may be either active duty, or medically retired active-component or reserve-component Soldiers. Depending on the success of the Wounded Warrior Education Initiative, officials said the program may be expanded to include other civilian universities, other Army institutions of learning or even other branches of service. "I want to thank KU for stepping up and setting up an opportunity for these fine Soldiers," Secretary Geren said. "The people of Kansas have always been great to the U.S. Army, whether at Fort Riley or at Fort Leavenworth - they are neighbors helping neighbors."